Another driver owes his life to a Tesla. Beyond the convenience of being able to have your car drive and park itself, autonomous cars are also being touted for their life saving potential. Previous reports asserted that self-driving technology is poised to reduce the amount of people who die on roads because of human error or choice. Last year alone, more than 35,000 people lost their lives in car accidents. Then there’s the fact that electric vehicles (EVs) don’t run on gas, which means they can help reduce air pollution. The American Lung Association suggests that EVs could save thousands of lives annually. Even the vehicle’s design is proving to be a critical lifesaving element, especially during a frontal collision – and the driver of a Tesla Model S P85D is now vouching for it. 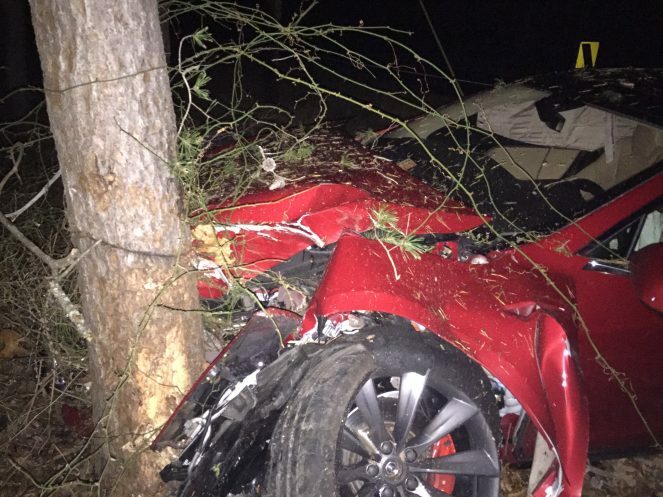 The driver, who prefers to remain anonymous, did not yield while making a sharp turn on a small road near Quantico, Virginia which led to the vehicle going off the road and ramming into a tree. He estimates that he was running above 72 km/h (45 mph) and below 121 km/h (75 mph). The front of the Tesla was totaled, with the hood nearly wrapping itself around the tree. But the lack of a large engine in the front of the vehicle means there were no massive objects that could’ve pierced through the passenger cabin. The area, referred to as the crumple zone, instead served mostly to absorb the impact. If it was any other automobile, the impact would have killed me. There are no solid objects under the hood of a Tesla that would’ve pushed into the car and into me. Also, I believe Tesla did a great job re-enforcing the front of the car to absorb the impact. The driver had scratches on his wrist and bruises on his chest, but was otherwise completely uninjured. He cites the incident as a “freak accident,” and adds that he looks forward to ordering a new Tesla, given that he can’t see himself driving anything else. Achieving Level 5 autonomy and perfecting the technology behind it is obviously no easy feat, but Tesla is working steadily towards it. On multiple occasions, Tesla’s technology has shown to be more than capable of preventing major accidents. Last year, a dashcam video captured Tesla’s Autopilot radar system correctly predicting a crash. Another incident involved a 37-year old who suffered a pulmonary embolism who managed to safely arrive at the hospital using the car’s Autopilot feature. Proving that Tesla’s safety features may also help save the lives of pedestrians, the system was also able to effectively prevent a collision even before the driver was able to hit the brakes. But the technology is still far from perfect – and Tesla, along with numerous other car manufacturers and tech companies, are continuously pushing to develop technologies that will guarantee the safety of drivers.